Google has made it easier to start Chrome applications using the program launcher for the host operating system (Start Menu under Windows or on the OS X dock), but it feels cumbersome. That’s whereAppJump comes in. Doesn’t everyone have Angry Birds installed in Chrome? 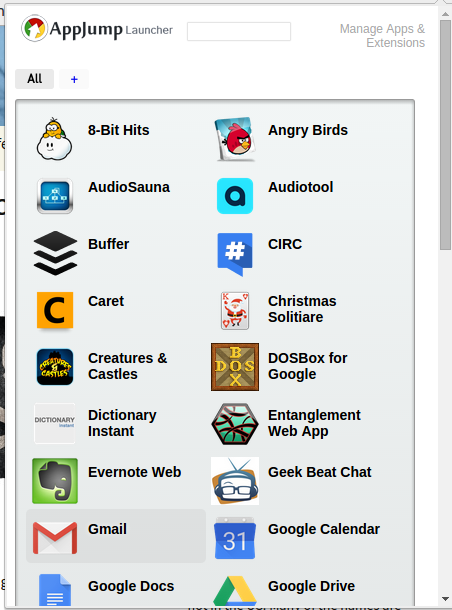 With AppJump, you can quickly access Chrome applications from the toolbar, without leaving Chrome. It also has the capability to organize your apps into specific folders. My biggest complaint is the inability to sync the Appjump settings between browsers. So when you jump between different machines, you have to re-create your AppJump set up.